Our practice specializes in the treatment of allergy related problems such as asthma, seasonal and year round allergies, hives, allergic reactions (such as reactions to food or medications), bee sting reactions, eczema (or other skin conditions) and sinus problems. Our staff emphasizes personal attention and education. We have a bilingual staff that speaks both English and Spanish. For your convenience, we also have two office locations. Dr. Mariana Marcu is committed to ensuring her patients receive the highest quality level of personalized, comprehensive allergic care. She has established a state-of-the-art medical practice where patients receive the latest and most advanced treatments, with access to in-office testing, lung function testing and preventative health care. 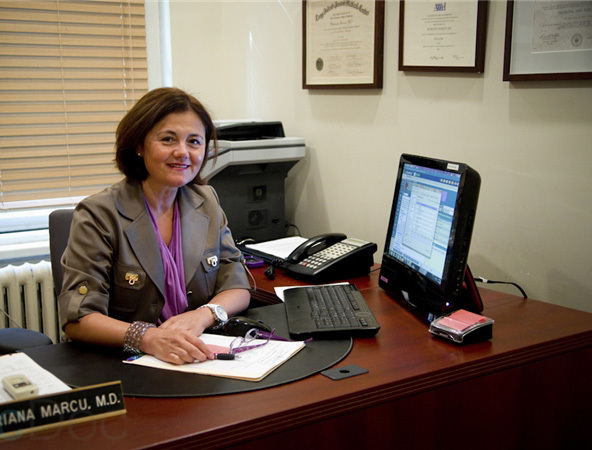 Dr. Mariana Marcu M.D., FAAAAI is a board certified allergist in New York City. With more than 15 years of clinical experience, Dr. Marcu specializes in skin allergic conditions, asthma, allergy immunotherapy for seasonal and perennial allergic rhinitis, along with insect venom allergies, and food and drug oral challenges. She conducts state-of-the-art testing and manages patients’ treatment in her two offices, which are conveniently located in midtown Manhattan and SoHo. Dr. Marcu is a graduate of Carol Davila University of Medicine and Pharmacy in Bucharest, Romania. She gained her certification from the American Board of Internal Medicine and the American Board of Allergy and Immunology. She completed her residency at NYHQ–New York–Presbyterian Healthcare System and continued there as chief medical resident for an additional year. Her Allergy, Asthma & Immunology fellowship was completed at North Shore–LIJ Health System, which was previously located at Schneider Children’s Hospital. Dr. Marcu is a fellow of the American Academy of Allergy, Asthma & Immunology (AAAAI). She is also a member of the New York Allergy & Asthma Society (NYAAS) and the World Allergy Organization (WAO). To keep up to date with the latest scientific developments, Dr. Marcu participates in the annual meetings of the American Academy and College of Allergy, Asthma & Immunology along with other international lectures and conferences in the field. In her free time, Dr. Marcu enjoys listening to jazz and classical music with her husband, attending art galleries with her daughter, and strolling through Central Park with Maggie, her cocker spaniel.